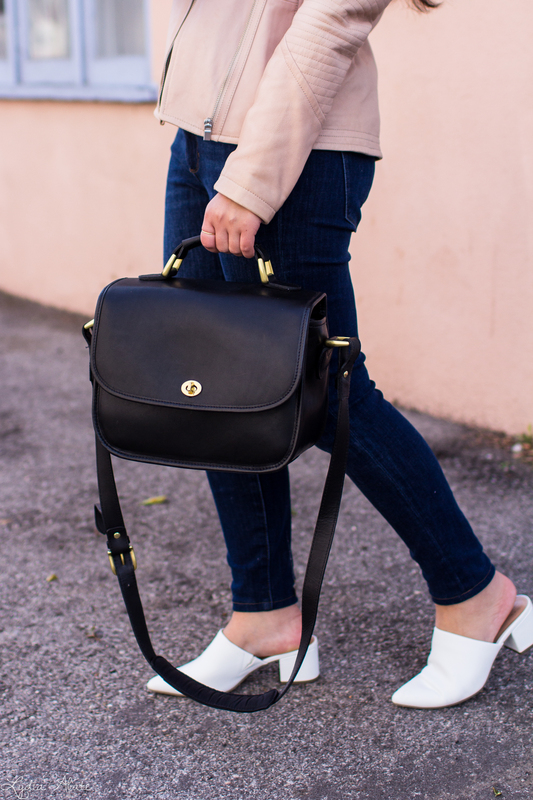 While I'm often spoiled and have a friend, family member, or fellow blogger around to help me out with outfit photos, while I'm in California I'm going to have to work hard to figure out the solo outfit photo shoots. When I'm home, I have my go-to spots, where I know the light is good, the foot traffic is low, and I've worked out the angles. Here I don't have a clue where to go, and I suspect finding a public spot that is also a bit more secluded will be even more of a challenge. I feel like I got a little lucky with this spot, it was about 12 blocks up from the beach in Santa Monica, and this alleyway was right off a main street with lots of shops, and tons of pedestrians. Fortunately since I was able to move off the sidewalk they were mostly out of the way, and then only a few cars drove down the alley that I had to worry about. Plus it was such a cute pink building! 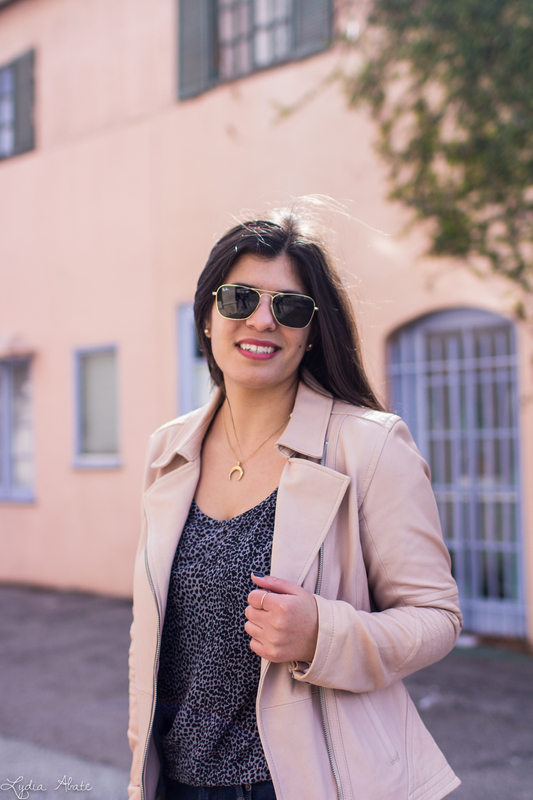 I love this blush jacket and I'm so jelly you get to spend so much time in Cali. 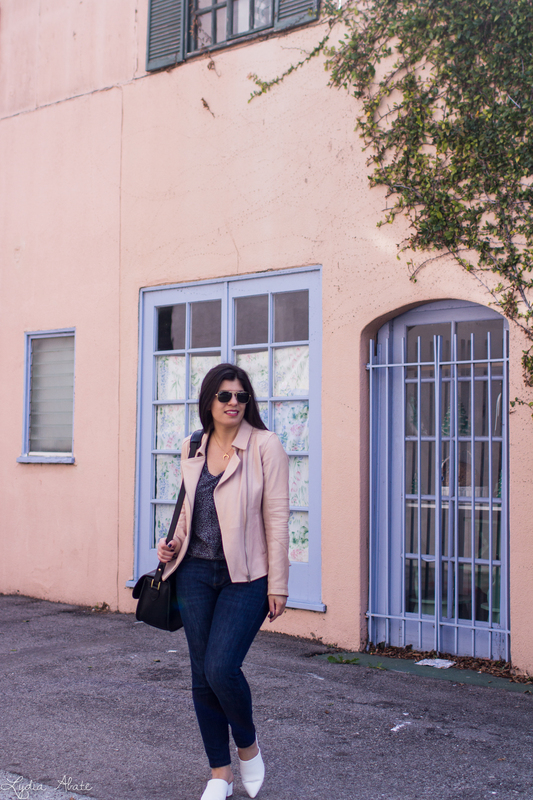 Finding good places for photos when you're away from home can always be a challenge but you've done pretty darn good (and I love the pink jacket - such a cute piece). These are so cute! I would love to set up my tripod and do a photo shoot by myself in the woods or something, going off my own inspiration and creativity! You look great.. love the crescent necklace. That is a cute stop. Do you use a tripod and take your own pictures? If yes, that's commendable. Love the color of your jacket. Gosh and I must have missed something, are you here in California for work? Did you move here?! That is a beautiful spot, especially for that outfit! 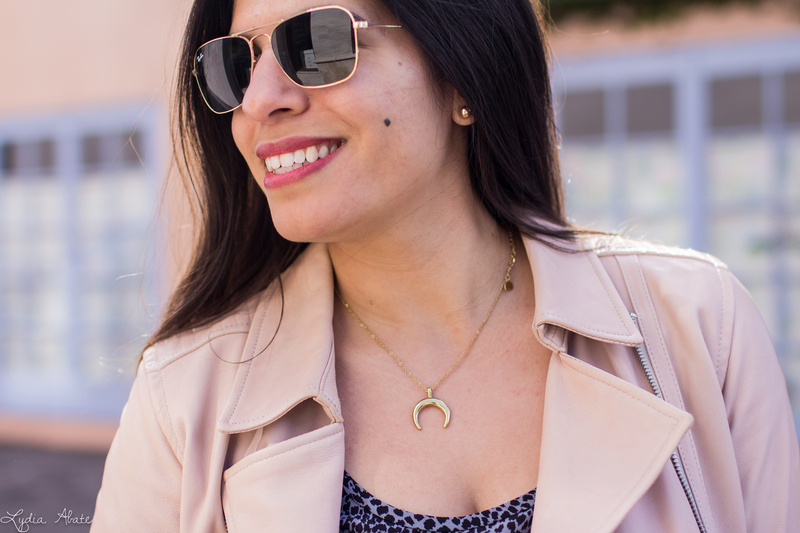 I love the grey printed tank with the blush jacket :) I have so much admiration for people like you who manage to go out and find different places for outfit photos each day - I take mine in pretty much the same spot every day, depending on the light, haha! Not very adventurous at the moment with the toddlers to contend with! I have never been to Santa Monica, but if looks like you found the cutest spot! 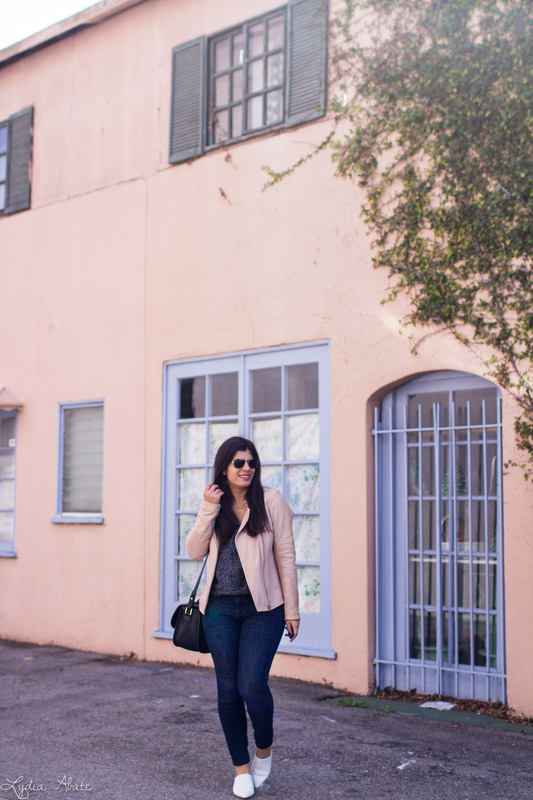 This is such a cute outfit and I am loving this blush jacket and white mules! Such gorgeous photos!! Santa Monica is one of my favorite places to visit!! I always stay at Casa del Mar!! I am loving the white mules! 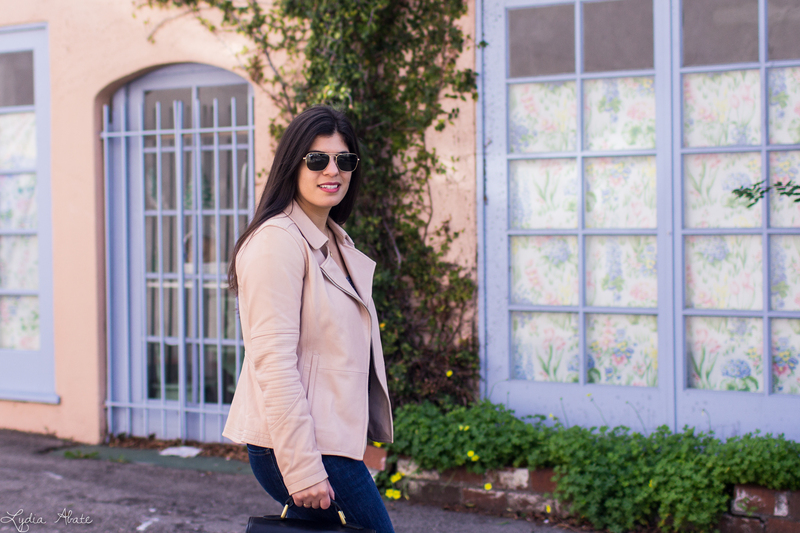 I love the blush jacket too, such a pretty color ! Santa Monica is my fave!!! Love your outfit and love that you took your own photos! Such a cute pink building! And I love that it matches the outfit so well. You're an expert at taking photos solo! You need to teach me your ways! I can never get the camera to focus properly when I take them myself! Hope your trip is going well! What a pretty backdrop to match your jacket. There are so many amazing old homes around my apartment building but just the thought of having to take the tripod there... and the people walking by are so discouraging. This alley way is quite the spot and love how it matches your outfit! You did find a great spot, and the building coordinates with the color of your jacket. I love that you went solo for photos, even in an unfamiliar place—that is impressive! Such a cute spot! I love Santa Monica. You go girl!! These pics came out awesome!! 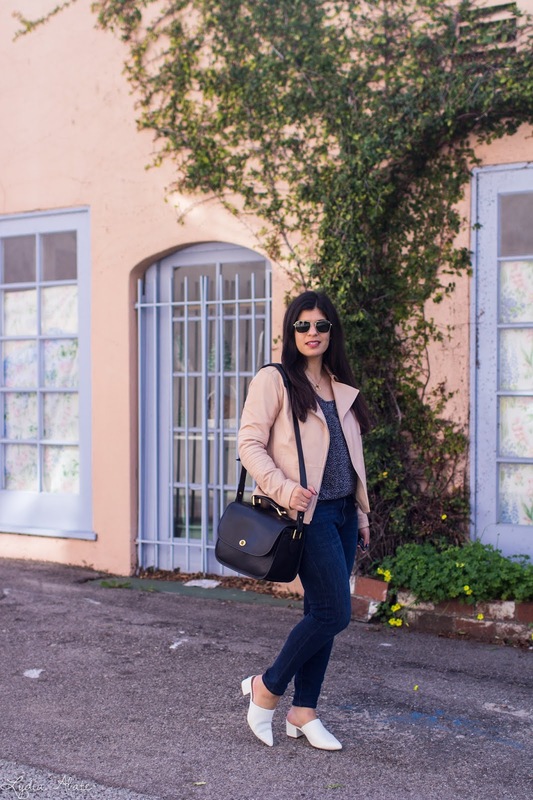 Love this look and how your jacket just happened to match the wall! Looking so chic with this outfit dear. Love the jacket, such a classic. Cute crescent necklace too.